I believe I picked a good time for my (working) vacation last week. Just about everyone I have spoken with since returning has told me how windy and rainy it was while I was gone. It sure was windy the first couple of days I was back and those thunderstorms were nasty too. I like to fish as much as just about anyone, but strong winds and especially lightning keeps me at the dock and preferably inside. Thankfully flounder fishing has been good and is usually pretty close by. That allows late starts after checking the weather or late afternoon fishing after work. The afternoon are always a question with building thunderstorms, but when it’s only a five minute run to a fishing spot, it’s easy enough to try. Heck, some nice flounder are being caught from docks along the Intracoastal Waterway and in area creeks, plus from the piers. Most fishermen rely on live baits to catch flounder and they work well. Mud and mullet minnows are probably the most used, but small spots and croakers, plus peanut pogies catch flounder well also. You have to remember that a flounder has to turn a live bait so he can swallow it head first or the fins will pop up and stick in its throat. Give the flounder plenty of time to do this or you’ll be eating slaw and fries with no fillets. If you miss strikes and reel in baits that appear to have been scaled, you’re trying to set the hook too soon. Patience!!! While there are a variety of manufactured flounder rigs, the preferred one along most of the Tar Heel Coast is a Carolina rig. The egg sinker has to have enough weight to hold it in place, but too heavy can be bad also. Leader length varies from about 10 inches to two feet and I prefer the shorter end of that. The leader must be strong enough to withstand some chafing on the structure that attracted the flounder and an encounter with the flounder’s teeth. Most fishermen use 20 to 30 pound test monofilament or fluorocarbon. Everyone has their favorite flounder hook. The Kahle style of very wide bend hooks is favored by many. These hooks have a very elongated bend that appears to be made just to fit a flounder’s mouth. A local favorite is the Eagle Claw Series 42 Wide Bend Hook. This hook has a wider bend than a standard J-hook, but isn’t as exaggerated as a Kahle hook. Capt. Jimmy Price likes them and that is good enough for a lot of fishermen – including me. Inshore fishermen are also beginning to catch good numbers of puppy drum and a few speckled trout. Both will hit lures, but feed in the same waters as flounder and often take baits intended for flounder. Pups can easily grab a large flounder bait, but trout take a little longer to turn and chew the bait. Pups and specks prefer live shrimp and if you would prefer to target them, shrimp are the most productive baits. Shrimp can be fished on the bottom on Carolina rigs, but often produce better when suspended under a cork about a foot off the bottom. Everything eats shrimp, so there will be some undesired fish at times, but sometimes a flounder will come off the bottom to eat a fat struggling shrimp. Large red drum are biting in Pamlico Sound and the lower Neuse River. They may bite throughout the day, but the best time is usually the late afternoon. As the sun drops in the sky the big drum move out of the deeper holes to feed along points and sandbars. Tarpon are moving throughout the same areas and usually stay in the deeper water. The tarpon action can be really good at times, but can be really slow also. There are plenty of Spanish mackerel just outside the inlets. Fishermen are catching them well trolling small Clarkspoons and Drone Spoons behind trolling sinkers or small planers. Some larger Spanish are being caught too, but most of them are either hitting smaller king mackerel baits or small live baits drifted just below the surface while flounder fishing in the ocean. When the wind allows heading offshore a bit, there is some action. Kings and a few dolphin are biting in 60 to 100 feet of water. There have been a few reports of sailfish attacking king mackerel and dolphin baits, so don’t be too surprised if it happens to you. Offshore bottom fishing has been good all summer. The action may begin at about 60 feet, but gets better at around 80 feet and is usually best in water 100 feet or deeper. The bottomfish mixture includes black sea bass, grouper, beeliners, grunts, triggerfish and porgys, plus some hog snapper and spiny lobster off Cape Fear. My wife and I just returned from Costa Rica and had a great time on the trip. It is the green (rainy) season, but we were blessed with a week that didn’t have enough daytime rain to prevent us from doing the things we planned. However, it rained every night. We stayed mainly in Jaco, which is a surfing and fishing town on the Central Pacific Coast and then visited Poas Volcano when headed back to the airport in San Jose. Capt. George and Anna Beckwith of Down East Guide Service (www.pamlicoguide.com) in Morehead City and Oriental also operate the Dragin Fly in Costa Rica and are licensed as travel agents in Costa Rica. They set this trip up for donna and me and paired us with Jeff Stokley of Wilmington and some of his family for a fishing trip on the Dragin Fly. Capt. George is one of Jeff’s and my friends in common and thought we would fish together well, which we did. In fact, we quickly became friends and will be fishing together some back here at home. Sightseeing was fun, but for me this trip was about surfing and fishing. 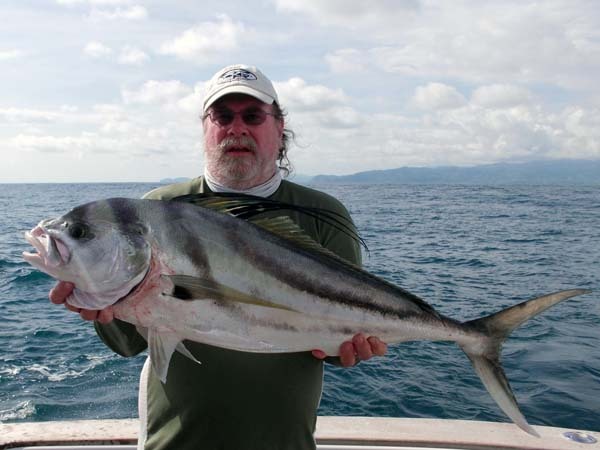 Many fishermen go to Costa Rica after billfish and they have a great variety. Blue marlin, white marlin, striped marlin and Pacific sailfish are all there. Unfortunately, they decided to go on a diet that week and weren’t biting. I have caught all but striped marlin, and while it would have been nice to have caught one, I wanted a roosterfish. 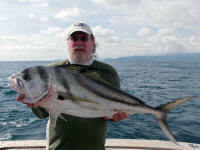 I had tried for a roosterfish several years ago on a trip to Guatemala and only had one strike that missed the hook. We didn’t get a strike here the first try either, but caught some red snapper (yes, you can keep them there) and tilefish for supper. The second try was for billfish, but after trying long enough to be sure they hadn’t suddenly changed their minds and gone on a wild feed, we moved back closer in to catch some grouper for dinner and try for roosterfish. The grouper were pretty easy, except for cranking them up from 400 feet deep, but the roosters continued to avoid us for most of the day. Finally Capt. James decided we would go to one of his roosterfish honey holes and see if it would produce. The first strike was quick in coming, but it was a swing and a miss. That bad feeling was creeping up again. donna battled what we thought was one for about 15 minutes, but it turned into an amberjack just before coming into view. After several more misses, I was wondering how a fish with such a solid reputation could be biting so softly as to steal the baits and not get hooked. Just as the doubts were really creeping in I got a solid hookup. Fifteen minutes later, after two pretty strong runs and what had become a slugfest of gain thirty feet and give up twenty-five, I was hoping I hadn’t put all that energy into fighting an amberjack. Jeff Stokley was hooked into something similar on the other side of the boat, when suddenly Capt. James called down from the flybridge to say one was definitely a roosterfish. With a surge of adrenaline from that, I stepped up the fight and brought mine to the surface. It was a roosterfish and a pretty nice one too. Roberto the mate leaned across the transom to grab it by the jaw and lift it in. Finally I could cross roosterfish off my bucket list. After a few quick pictures, Roberto released the big rooster and we all turned to encouraging Jeff to get his in. We still hadn’t seen it yet, but were hoping it was a rooster. The fish took one last run straight down and then allowed him to reel it to the boat. Jeff’s fish was a rooster that was just a little larger than mine, but both were definitely sights for sore eyes (and backs). The trip must have gone pretty well as donna is already making a rough plan for the next trip. If you are interested, contact Capt. George or Anna Beckwith at info@pamlicoguide.com. The Marine Fisheries Commission will meet August 22 to 24 at the Brownstone Hotel in Raleigh. The agenda and more information is available at www.ncdmf.net. There will be time for public comments at the meeting. The last of the South Atlantic Fisheries Management Council (SAFMC) meetings to solicit input on proposed federal fishery management measures including: changes to permits and reporting, shrimp fishery issues, federal dealer reporting, and measures proposed for king mackerel, Spanish mackerel and cobia was held in New Bern on Thursday, August 16. A Marine Protected Area (MPA) Workshop was held in conjunction with the meeting in New Bern. Additional information is available on the SAFMC website at www.safmc.net or by calling toll free at 866-SAFMC-10. SAFMC wants your comments even if your schedule didn’t allow attending the meeting. Directions for sending comments by e-mail, fax and mail are available at the SAFMC website at www.safmc.net. I was originally scheduled to be at West Marine in Morehead City this Saturday, August 18, to give presentations on using marine electronics on kayaks. Due to some unforeseen circumstances, this has been postponed until September 22. The presentation will include information on fishfinders, GPS units and rigging them, featuring special attention to lightweight batteries and optimum and convenient transducer placement. The Pirate’s Cove Billfish Tournament began on Tuesday, August 14, and fishes through Friday, August 17 from Pirate’s Cove Marina in Manteo. This is the seventh of seven events in the 2012 Governor’s Cup Billfishing Series and also includes an offshore gamefish category. The sailfish bite has been very hot and sailfish catches (and releases) led the action for the first three days. Capt John Bayliss and the Tar Heel crew led Tuesday's action with 350 points from five releases. Capt. Jesse Grantizki and the crew of the Bi-Op-Sea had a super day on Wednesday and released nine for 630 points and the tournament lead, which they held going into Friday with 1,120 points. The Seabreeze, with Capt. Ned Ashby collected nine releases for 630 points to lead the day on Thursday. The Double B, with Capt. Daniel Spencer, brought a 521.1 pound blue marlin to the scales Thursday afternoon and leads all the categories for weighed marlin. The tournament concludes Friday. For more information visit www.pcbgt.com. The Oriental Rotary Club moved their Annual Tarpon Tournament from the last week in July to August 18 and added and inshore slam tournament for flounder, redfish and trout. For more information visit www.orientalrotary.org. The Sneads Ferry Rotary Club is hosting their annual King Mackerel Tournament on Saturday, August 18 from New River Marina in Sneads Ferry. For more information visit www.sneadsferrykmt.com.